A superb display by Sale Sharks fly-half Danny Cipriani and a storming first period set up a crushing eight-try win over Exeter at Sandy Park. Play-off-chasing Sharks capitalised on a sloppy home start, scoring through Michael Paterson's break and simple tries by Tom Arscott and Sam Tuitupou. Fetu'u Vainikolo's try gave Exeter hope but they capitulated after the break. Tuitupou, Dwayne Peel, David Seymour, Tom Brady and Andrei Ostrikov all crossed in an amazing final 22 minutes. When Cipriani added the extras to make the score 33-7 after Peel crossed in the corner - his third conversion and final act in a superb individual display in front of watching England backs coach Andy Farrell - it ended Exeter's resistance. Up until then the home side's improved performance in the early stages of the second period meant they still had a slim chance of a fightback against a side placed just one position above them in the Premiership table, but who have now confirmed their qualification for next season's European Rugby Champions' Cup. But the late humiliation rounded off a truly miserable afternoon which began when an already depleted Chiefs pack learned that influential captain Dean Mumm was missing after failing a late fitness test. And the Australian's absence seemed to be a telling factor in a first half which saw a lack of leadership in the forwards and some uncharacteristic sloppy tackling and basic handling errors. Sale's opening try came as a result of a combination of all three after a misplaced pass led to Sharks winning possession and advancing up the pitch. Paterson charged through two weak attempted tackles following a lineout and also fought off Gareth Steenson before touching down. Cipriani added the extras, and he had another chance of a conversion not long after, setting up the away side's second try with a clever pass that allowed Arscott the simple task of crossing in the corner. Cipriani's conversion came back off the post but he did add another with a more straightforward kick almost immediately from the restart when some awful Exeter tackling allowed Sam Tuitupou to run through. At 19-0 down, Chiefs rallied and were unlucky to be denied what looked like a certain try when they were awarded a penalty with Sam Hill set to cross the line. The feeling of injustice did not last long though and the hosts did get on the scoresheet when Tongan Vainikolo burst through the middle following a ruck, some patient build-up and a fine break by Kai Horstmann. The initial second-half improvement gave the home side hope but despite plenty of pressure, they could not breach the Sale defence. Vainikolo added a second try and after Peel crossed following a poor line-out, the visitors seemingly scored at will. Seymour, Brady and Ostrikov all crossed in the closing stages, with Joe Ford kicking two conversions and a drop goal. 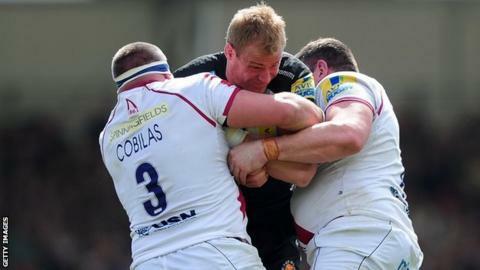 Carl Rimmer did touch down for Exeter's only score of the second period but it was barely celebrated by a disbelieving home crowd. "I was a little disappointed with this performance, which didn't really look like a highly motivated side that was going to fight tooth and nail to cement seventh place. "We were in before today but we weren't by the end of the day and that is purely down to us, it was all in our hands. "I said some truthful, rather than harsh, words to the players and said that sometimes you have to look at a game that has been a humbling experience." "This is a difficult place to come so we are delighted. We played well and we reminded the players in the week that we hadn't won here before. "We hit form today and if we do that with the players that we've got then we can score tries like we did. "We didn't expect to win by that scoreline by any stretch of the imagination." Exeter: Dollman; Vainikolo, Whitten, Hill, Jess; Steenson, Lewis; Moon, Yeandle, Brown, Phillips, D Welch, Ewers, White, Horstmann. Sale: Arscott, Brady, Leota, Tuitupou, Ingall, Cipriani, Peel, Lewis-Roberts, Jones, Cobilas, Mills, Paterson, Gaskell, Seymour, Fihaki. Replacements: Ostrikov for Fihaki (47), Easter for Mills (58), Ford for Cipriani (64), Harrison for Lewis-Roberts (64), Taylor for Cobilas (64), Thomas for Jones (64), Jennings for Tuitupou (67), Cliff for Peel (67).